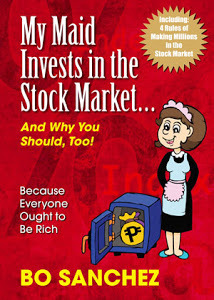 Before the year ends, allow me to uncover to you my Top 10 Truly Rich Club Review + Stock Market Philippines + Bo Sanchez' blog posts, gained with the most numbers of views year 2013. No sense to you, but it mattered to me, so please read in case you haven't read some on these blog entries. These posts helped me generate almost close to 5 figure monthly passive income. Thanks 2013 and TRC. To all of my blog readers and all TRC subscribers and soon-to-be-members, I wish and pray for your perpetual success in all areas of your life, whatever it is, financial, spiritual, mental, emotional or physical, not just for the coming year 2014, may you continue to receive all the blessings from Him in every gising that will come. Remember this.... Every Gising is a Blessing! :) Keep shining and Stay Remarkable. PS. YOU, yes YOU! Read this now... 21 Reasons and Benefits Why I SUBSCRIBED To The Truly Rich Club and Why YOU Should Too a lot of people also commented on this review, you can read their comments too.